Soft cover, 144 pages, 114 colour photographs, 2 colour illustrations, 30 black and white photographs, 1 black and white illustration, Timeline, Glossary, Resources. A worthy inclusion to surf literature, the only other book on women's surfing to date being Marion Stell's biography of Pam Burridge. Andre Gabbard is the co-author with Greg Noll of Da Bull. 1.Rare photograph of Duke Kahanamoku by Tom Blake, page 20. 2. Kathy 'Gidget' Kohner surfs inside Malibu, photograph by Warren Miller, page 33. Originally published in Longboard May/June 1999. Details the women who rode Matt Kilvin and Joe Quigg's lightweight balsa malibus, circa 1951 - The Girl Boards. 5. Lisa Anderson, Surfer magazine cover and caption Lisa Anderson surfs better than you, 1995, page 110. 6.Layne Beachley, 30 foot tow-in, Photo Art Brewer, page 114. Prentice-Hall Inc., Englewood Cliffs, N.J. 1960. Hard cover, 202 pages, black and white photographs, black and white illustrations, Selected References. Soft cover, 122 black and white photographs, Australian Championships Results, Index. An detailed work true to it's subtitle, mostly concentrating on contest results, with some background information where appropriate. Surfboats feature throughout the book, with occassional surfskis and boards. Old and modern surfski ('Snow' McAllister and Michael Pietre), page 8. Australian S.L.S.A. team at Outrigger Canoe Club, Honolulu, 1939, page 64. Duke Kahanamoku at Torquay, 1956, page 108. US-Hawaiian team members (withpaddleboards) Torquay, 1956, page 112 (incorrectly captioned "first of the malibus"). Although the S.L.S.A. has concentrated on racing, many famous surfboardriders (Claude West, 'Snowy' McAllister, 'Bluey' Mayes,...Tom Carroll) appear in the text and/or results. 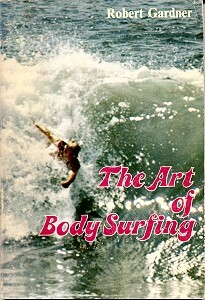 "Barry Galton, author of Gladiators of the Surf, died this year in Jan or Feb on the Gold Coast. He and his wife Moyra were great swimming mates of my mother's and I saw them both occasionally. I understand that Barry had written several books on surf life saving. He was a journalist with News Ltd and the Gold Coast Bulletin for many years. I think I still have a copy of his obituary from the Bulletin. I have my mother's copy of the book." Conway Maritime Press, London, 1997. Soft cover, 143 pages, black and white photographs, illustrations and maps, Bibliography, Glossary, Index. An excellent book that is highly detailed and with intense analysis, however its focus is determinedly fixed on Northern Europe. Soft cover, 83 pages,13 black and white photographs. History in Chapter 2 (Duke Kahanamoku, Buffalo Kealana, Mickey Munoz). 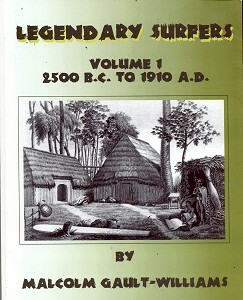 Legendary Surfers: Volume 1 - 2500 B.C. to 1910 A.D.
Soft over, 358 pages, black and white illustrations and photographs. Surfing - A Way of LIfe. An imprint of BDD Promotional Book Company, Inc.
Hard cover, 128 pages, 132 colour photographs, Index. 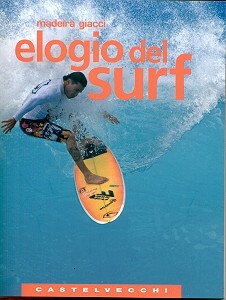 Large format book that covers large spectrum of surfing topics. Of most interset is early history in Chapter 1 : The Sport of Kings, Chapter 2: the impact of Bruce Brown's Endless Summer on surfing exploration and surfing's relationship with Hollywood, Chapter 7. Although Aaron Chang's photography is of a high standard, the almost exclusive use of his work is limiting when the text attempts to cover large areas of subject matter, although there is some historical material from other sources. Hard cover, 112 pages, 132 colour photographs, Index. Most interest is Chapter 2 Birth of a Surfing Nation (pages 18 to 30) detailing the US/Hawaiian team visit in 1956 for the Melbourne Olympics. Although Jeff Hornbaker's photography is of a high standard, the exclusive use of his work is limiting when the text attempts to cover large areas of subject matter, particularly when dealing with historical material, compare Nick Carroll : The Next Wave, (1991). 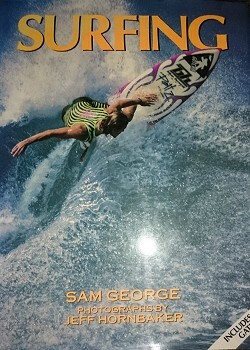 Very similar format to Sam George: Surfing - A Way of Life (1990) above. 1. "As (1964) world champ, Midget went on to become the first international surfer to win Hawaii's prestigious Makaha Championships (in 1962! )", page 23. 2. 1967 shortboard development ignores the significant contribution of Midget Farrelly, page 24. 3. 1977 MR twin fin development neglects to mention the early 1970sTwin fin and Reno/Fish influence, page 27. 4. Rodney Sumpter's career as an English surfer fails to mention that he leant to surf in Australia and was already highly competitive before returning to England in the mid-1960's, pages 98 to99. George, Sam (editor), Foreward by Shaun Tomson. 15 West 26th Street New York, N.Y. 10010, 1993. Soft cover, 128 pages, 132 colour photographs, Index. 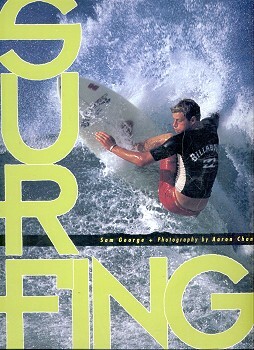 Paperback re-print of Sam George and Aron Chang's Surfing - A Way of LIfe (1990), above. 85 Second Street San Francisco 94105, 2001. Hard cover, 168 pages, +150 colour photographs, 50 black and white photographs, several colour illustrations, Index. Ultimately this collection must be a disappointment, the task of compressing 40 years into a mere 168 pages a near impossibility. The photography is to the expected high standard, however some photographs were not originally published in the editions as indicated, and in many cases the selected articles are abridged versions. Apart from the difficult decisions as to what as in and what was out, there are no Surfer Tips, Design Features or World Contest Reports. Where is the Duke Kahanamoku - Surfer of the Century issue, circa 1999? Where is the full catalogue of Surfer covers ? - a selection only is provided on the end papers. Selections are identified by issue number only, dates would have been a simple but significant addition. Worst of all, this publication probably supplants the future possibility of individual volumes by decade that would have provided the scale to do such a project justice. 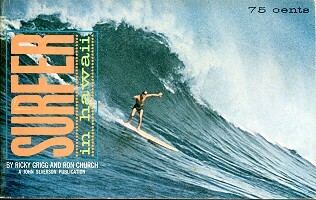 Published in Surfer Magazine Volume 9 Number3 circa May - June 1968. Vol. 1. No. 2 December1967 - January 1968 Page 9. Bob McTavish : "LADIES AND GENTLEMEN AND CHILDREN OF THE SUN.."
Craig Stecyk : Curse of the Cumash pages 68-69. Note : Apart from the articles, a companion volume detailing the magazine's extensive advertising features could be of similar interest. 680 Second Street San Francisco 94107, 2010. 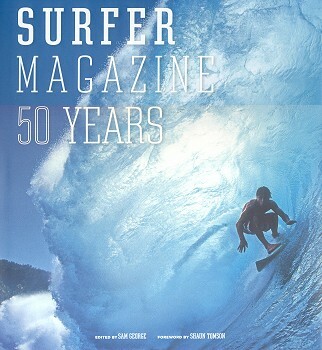 A retrospective in five selected themes (Travel, Surfers, Design, Performance, Culture and Photography) across fifty years of Surfer magazine. Each section comprises essays by previous editors or contributors, richly illustrated with photographs spanning the period. 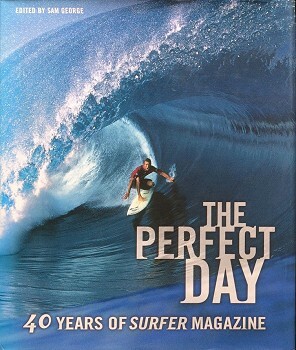 A somewhat more satisfying publication than The Perfect Day - 40 Years of Surfer Magazine, see above. Soft cover, 216 pages, colour and black and white images, Glossary, Bibliography, Index. Italian publication with Italian text, with an expansive collection of images. 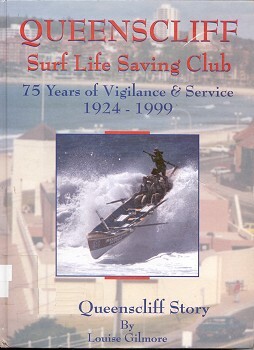 Queenscliff SLSC - 75 Years of Vigilance and Service. Queenscliff Surf Life Saving Club Inc.
Hard cover, 156 pages, black and white images, Appendicies. For extracts see Queenscliff SLSC. Layne Beachley - Beneath the Waves. Level 3, 100 Pacfic Highway, North Sydney NSW, 2008. Soft cover, 347 pages, black and white and colour plates, Supporting Cast, Contest Record and Awards. 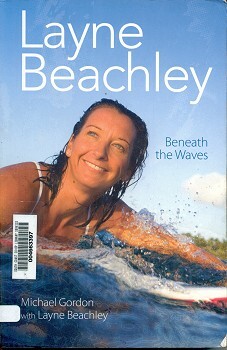 Covers Beachley's early life and professional surfing career with a large proportion dedicated to her family and personal relationships, particually her reconciliation with her birth-mother. Copy courtesy of Shoalhaven City Library. 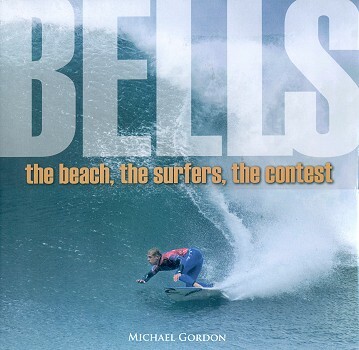 Bells - The Beach, The surfers, The Contest. Hard cover, 264 pages, black and white and colour photographs, Results, Index. The book opens with four chapters covering the history of Bells Beach followed by chapters devoted to each contest winner from 1962 to 2010. Featuring many excellent photographs by John Witzig and Barrie Sutherland, unfortunately for the aficionado, most have been published many times before. Hard cover, 276 pages, extensive black and white and colour photographs, text in English, German and French. 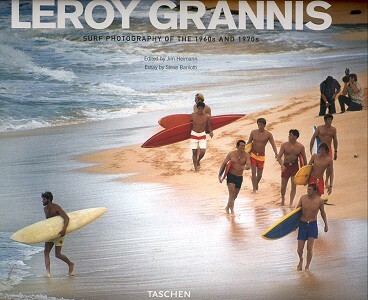 Excellent overview of one of the era's outstanding surfing photographers. 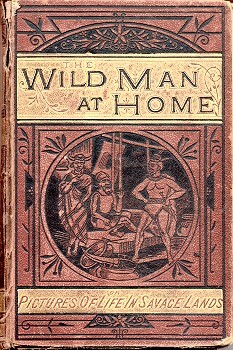 Reprinted as The Wild Man at Home in 1885, see below. Page 96 (illustration by Harden S. Melville) and page 110 (quoting Rev. Ellis). 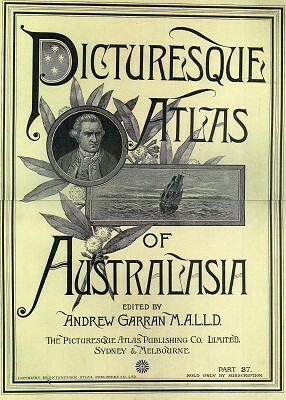 Woodcuts and design by Harden S. Melville. 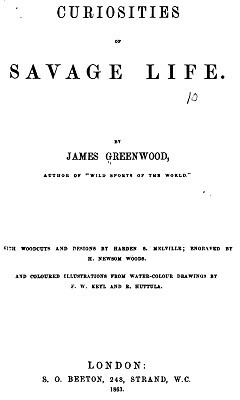 Reprint of Curiosities of Savage Life (1863), see above. Soft cover, 67 pages, duotone photographs, black and white photographs, one map. Big Surf, Deep Dives and the Islands - My Life in The Ocean. PO Box 10150 Honolulu, Hawai'i 96816, 1998. Soft cover, 179 pages, black and white and colour photographs and illustrations,Chronology, Name Index. 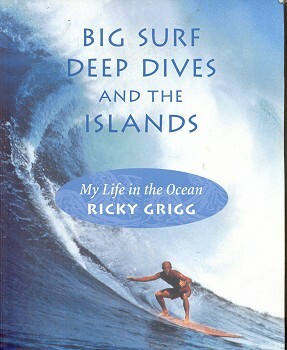 Ricky Grigg's work stands out as an unique combination of big wave surfriding and oceanography, based on extensive and intensive personal experience. One interesing example is his calculations that indicate the largest swells to reach the southern shores of Ohau are in the range "15 feet or at the most 18 feet", disputing early accounts reporting larger waves, pages 86, 87, 88 and 89 (Sidebars). Note that on the page 87 (main text) he notes the various methods of estimating breaking wave height and (apparently) endorses a calculation "from crest to trough". See Bascom: Esimating Breaking Wave Height (1964). Furthermore, some photographic evidence possibly moderates Grigg's contention. 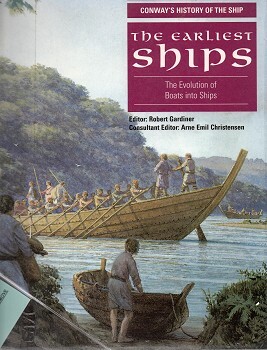 See Holmes: Hawaiian Canoe (1993) page 108. Unfortunately, a brief account of surfriding dynamics (page 82, Sidebar) is rudimentary. Surfers : A line-up of surfing's most inspirational characters. The majority of surfing's most inspirational chacters rip in the surf, earn heaps of money, drive hot cars, drink beer/do yoga, attract numerous women, and all their mates think they are great. Their mates are, invariably, also one of surfing's most inspirational chacters. The most interesting profiles are Peter Troy, David Guiney, John Frank (all non pro-surfers), Lane Beachley and unknown pro-competitor, Wade Glassock. The entries for Occy and Rabbit add little to previously published work - they both have their own books, coincidentally advertised in the back pages of this book. The author is a former pro-surfer and Tracks magazine editor/journalist, and it shows. 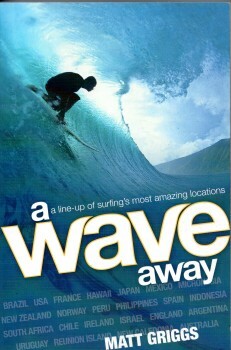 In surfing's long history, the achievements of most of the surfers in this book are virtually insignificant. Even the dramatic surfing performance of Kelly Slater (who apparently declined an interview) appears modest, when compared with the contributions of Duke Kahanamoku. The mis-spelling of Kahanamoku, page 261, .is most unfortunate. A Wave Away : A line-up of surfing's most amazing locations. Soft cover, 295 pages, black and white photographs, colour plates. Rather than a guide to the world's surfing locations, Griggs relates his personal experiences and observations at some famous, and some obscure, surf breaks. Soft cover, 159 pages, 45 black and white photographhs, Glossary. Noted surfers include Shaun Thomson, George Greenough, Nat Young and Micki Dora. Many of the photographs are rare and of high quality. Soft cover, 106 pages, 10 b/w photographs, 53 b/w illustrations / maps / graphs, glossary, bibliography, index. An academic work prepared as a textbook, each chapter includes Learning Objectives, Exercises, Questions etc. Module 3 : Waves, Tides, and Shoreline Processes is of most interest to the surfing reader. If you have ever wondered how a moderately stratified estuary differs from a salt wedge estuary then the answer is probably in this book. Published by Airglide Publications, Long Beach California.1979. Soft cover, 310 pages , extensive black and white photographs and illustrations, Contributions. Note that the bottom photograph has been flopped..
Development history in Chapter 2 credits Woody Brown and Phil Edwards as precedents to Hobie Alter's design. 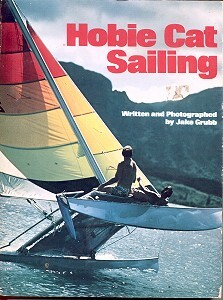 Note photographs of Hobie at Makaha 1961 , page 25 and shaping a balsa paddleboard, page 26. 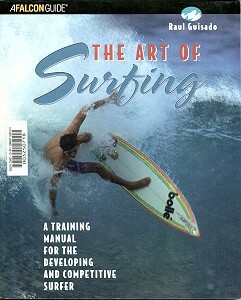 A Training Manual for the Developing and Competitive Surfer. Soft cover, 178 pages , extensive black and white photographs and illustrations, Glossary, References, Index. 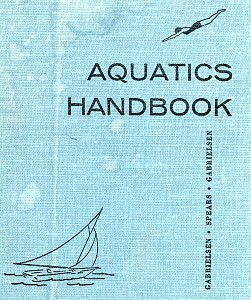 Board design has seven pages, including fins 14 to 20. Surfing history is covered in one page. I could find no discussion, comments or even a refernence to "Art" in any context, surfing or otherwise. The book is severely mis-titled. 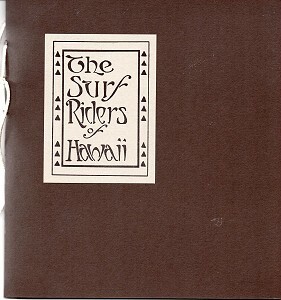 The Surf Riders of Hawaii [reproduction]. Handmade by Timothy T. DeLaVega, Hanapepe, Kaua'i, 2013. Originally published by A.R. Gurrey Jr., Honolulu, between 1912 and 1913. Soft cover, 6 pages ,black and white photographs glued onto heavy-weight pages. The Life and Times of A. R. Gurrey Jr. The Surf Riders of Hawaii- Centennial Edition. Soft cover, 12 pages , black and white photographs glued onto heavy-weight pages. An exquisite limited edition publication, congratulations to Tim of an obvious labour of love. A.R. Gurrey Jr., Honolulu, 1911-1911. 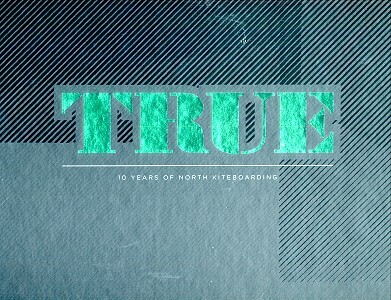 True- Ten Years of North Kiteboarding. Hard cover, 320 pages , black and white and colour photographs and illustrations, Photograph credits. Amazingly lavish book that, with its emphatic concentation on North products, their designers and their sponsored sailors, is an extreme in company promotion. The kite-line book mark is a stylish touch. This copy kindly donated by Mr.Terry Gallagher, with many thanks. Geoff Cater (1999 - 2018) : References - Books - H.